I love carousels. There’s a sense of magic about them. So of course the place of my daydreams – BrightSea Village – has to have one. Here’s my progress over the first three weeks. This entry was posted in BrightSea Village on April 12, 2016 by Elli Jenks. 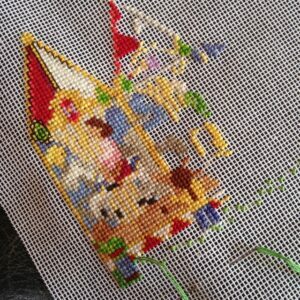 Thank you, Jan. Lots of fun to stitch. Thank you. It should look pretty once the beads are added. 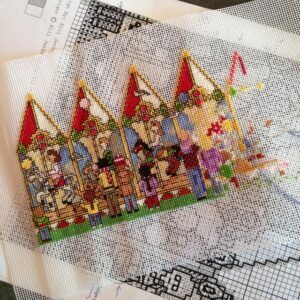 I stitch the BrightSea Village designs on 18 count (hpi) canvas. 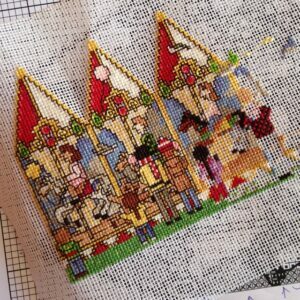 Some of my customers have used aida instead and were happy with the result.